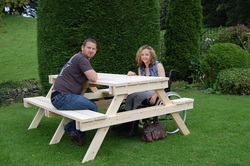 RJL Joinery have an exciting new product - wheelchair accessible picnic benches, providing seating for everyone. We have developed this unique product with first hand knowledge of those who might use a wheelchair. The benches are made from locally sourced timber and tanalised for preservation. This new product will help businesses to meet the ongoing requirements of the Equality Act 2010. The benches are also useful for babies and children, accommodating highchairs and buggies with ease. Our standard size benches measure 2000 x 1620 x 820 mm. We are happy to manufacture to your specific requirements, and can deliver pre assembled or flatpack, according to your needs. Photographs taken at the Castle Green Hotel, Kendal. "The need for service providers to provide facilities for disabled people under the Disability Discrimination Act and now the Equality Act has been well-documented in the past 15 years. It is refreshing to find a company that has developed a product that will help enable a wide range of businesses to meet their obligations under the legislation. 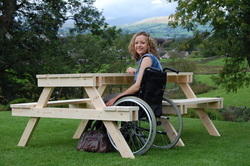 Local authorities, country parks, attractions, pubs, bars, restaurants with gardens or picnic areas will find that this product will enable wheelchair users and parents with children in buggies to use a picnic table that has been specifically designed to meet their needs, without compromising on quality. 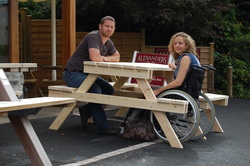 I would recommend that businesses who provide picnic tables consider this product as part of their commitment to providing services for all users."